Ever since I started studying Shakuhachi and found out there was a Zen sect that was developed around it, and it was a off shoot of my own Lin Chi sect, I have had an interest in knowing more about the practice, the philosophy, history, etc. I was introduced to a real life Komuso monk via another on-line acquaintance. The internet has real value on bringing stranger together. 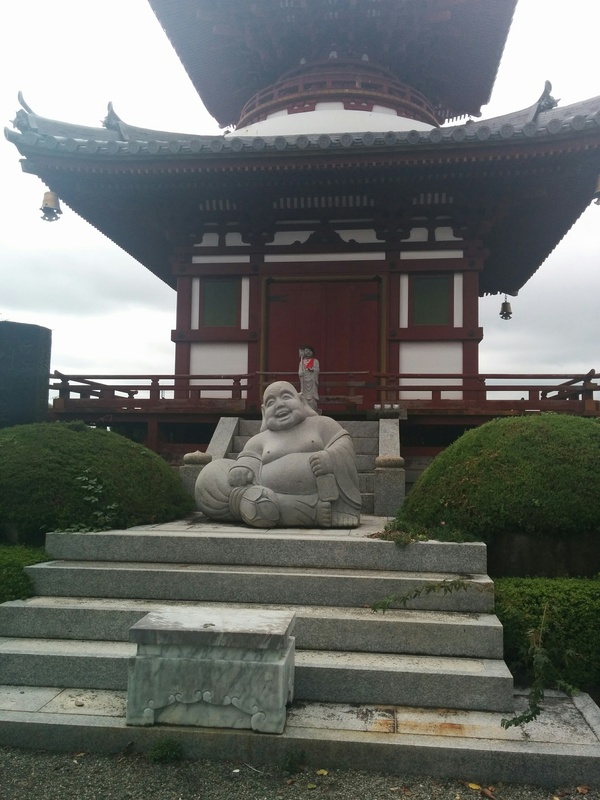 We had a few messages via on-line and finally I got the chance to meet in person in Nara. I had a day scheduled for the trip, there was supposed to be two other meeting up with us,but it turned out to be only one other a student of hIs and she was late. 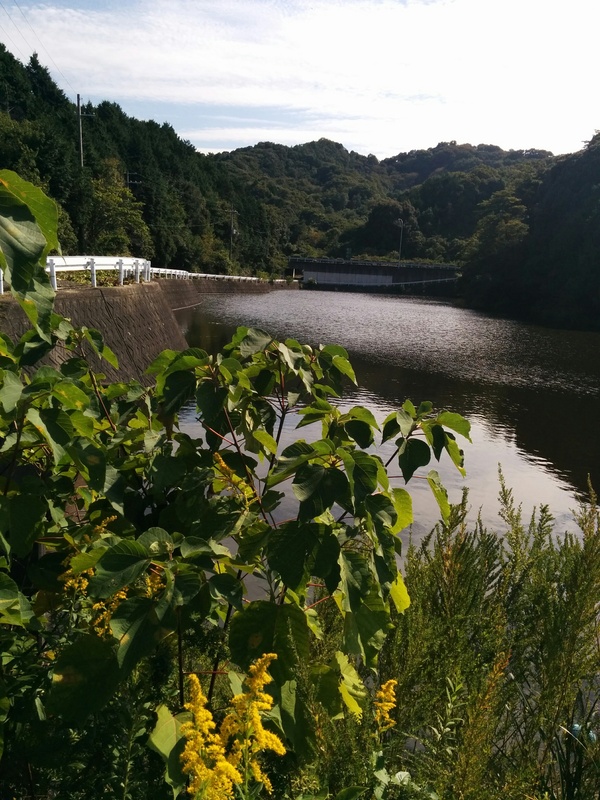 It was a good day to visit Nara, the weather was good, for our 6 mile walk around the hills and by-ways of the town. I got to listen to listen to some things about, my new acquaintance and Zen Brother lets call hIm “J-monk” practice. 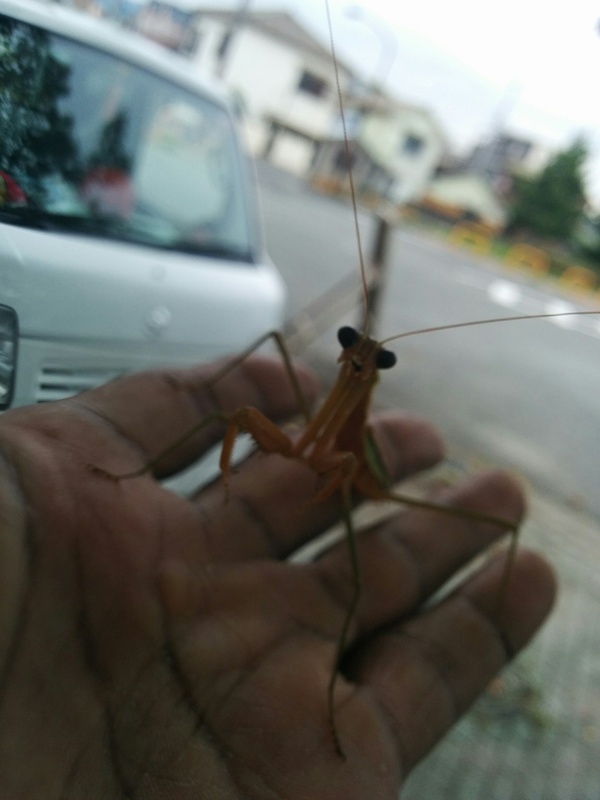 He is pretty much the local face of Kumoso around Nara. Playing a begging around the town on a regular bases. This is his connection to the community, this is his bring his Zen practice to the people. It is a live practice, not just sitting in the mountains. I found that most interesting. Another interesting I found is that he is on the bad side of his Sensei, perhaps for being too “out there” too much in touch with the community. Not in a bad way, but a good way. To the point he gets praised and his sensei get jealous. That says a lot about the weakness of his Sensei’s practice. It hits home with me being someone I thought was my friend, who is also considered a “Zen” master also has a big weakness as a person in his practice. Labels are just words, when one does not have the heart fill the reality of the meanings. It shows, in another sense, people are just people and no man “walks on water”. It would also seem from what I was hearing is that a large amount of the Komuso only are active for public displays. Ceremonies, parades, that sort of thing. Also it seems , the already small number of monks is in decline, because the senior monks are not really active in taking new students. This is just generally speaking from what I heard, and not to be taken as gospel. The Komuso also from what I gathered do other Renzai type training as well, chanting, zazen, the like, but the main focus is the Shakuhachi. J-monk had said he has found that it more about the breathing that gives one the meditative state than the music it self. Which goes along with my thoughts, and research from other paths and studies. Including input from another Zen teacher of mine on doing Zazen, using breathing techniques before Zazen to put one in the correct state to be respective. 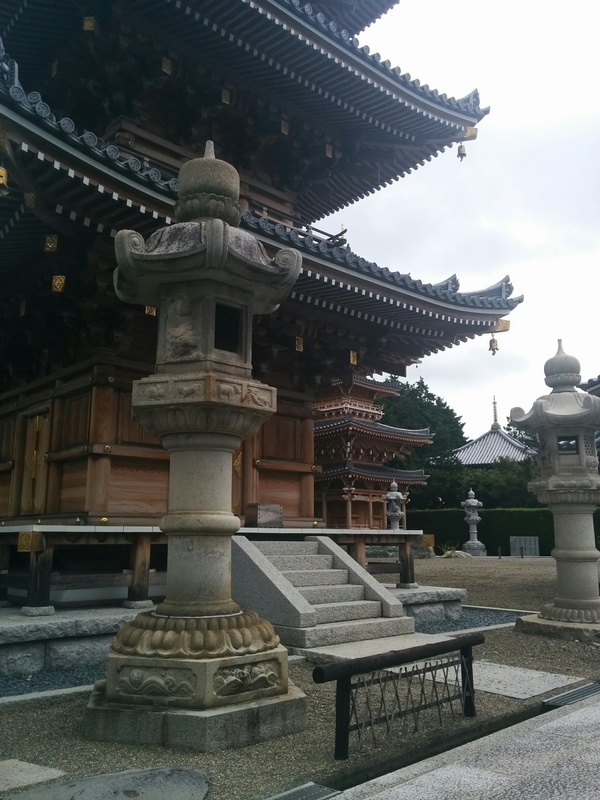 So we walked around Nara, took in some sights of old temples and shrine. Even walked a bit in the woods off the main trails. 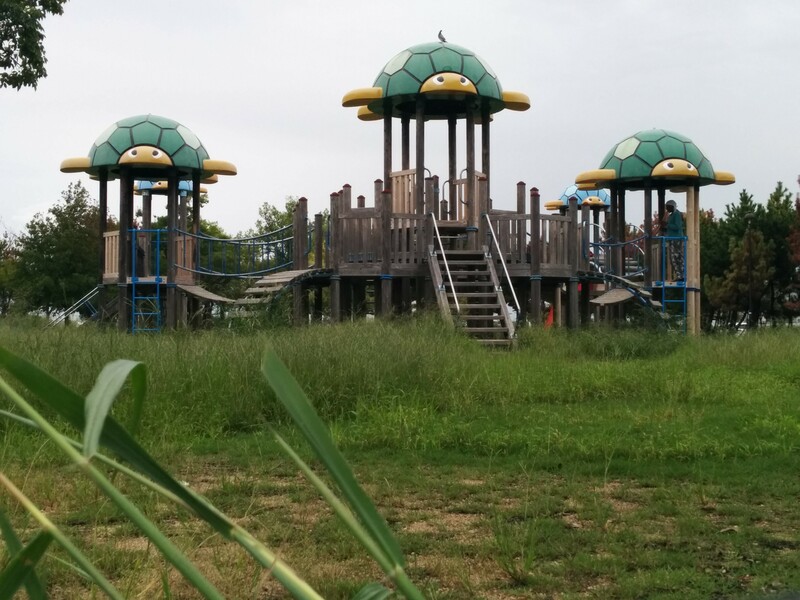 All the while J-Monk’s student collected Pokimon-Go monsters around town. 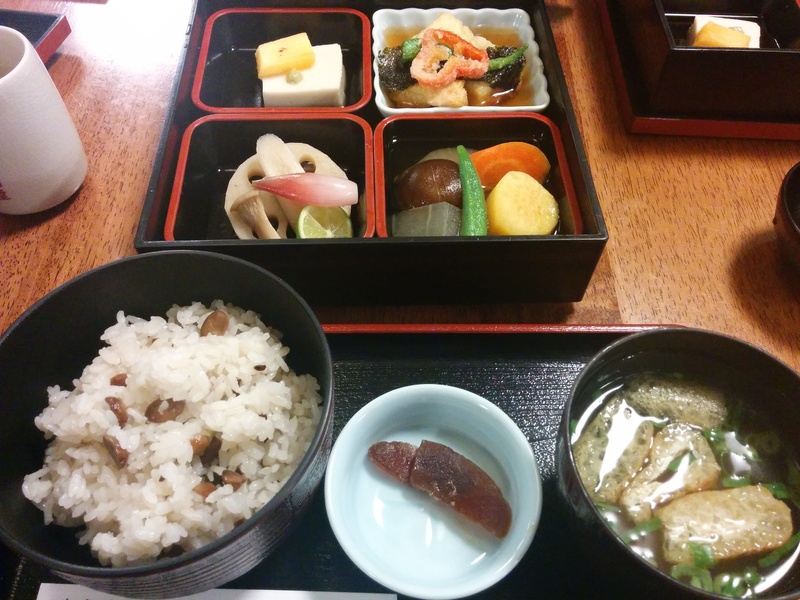 We hd a great veggie lunch at a place that is off times too crowded to get service at times. We just happen to hit it right. It was a good and interesting day around Nara. I took my serious camera along, really I lugged it around but only used my phone camera. So I had a sore back and knee afterwards for nothing. Oh well, it was a good thought, but not a day for taking serious photos. More of a smartphone shot kind of day. 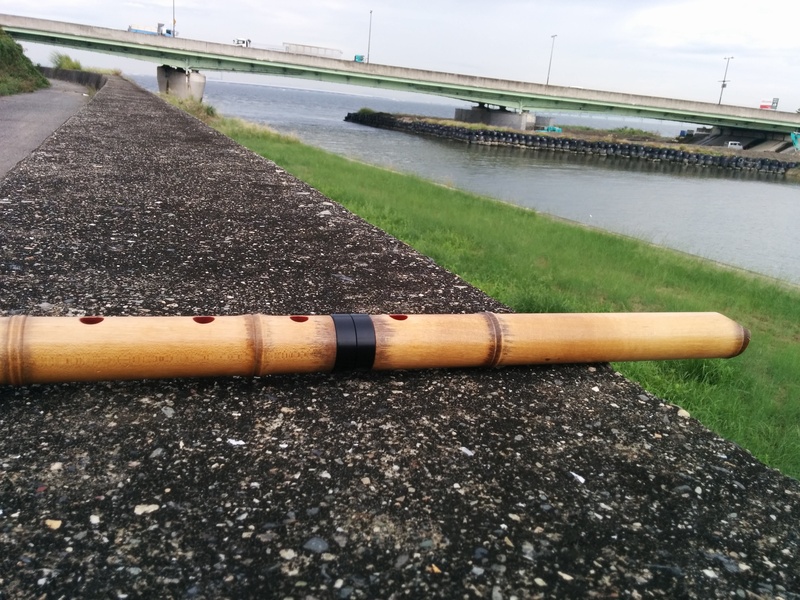 I also had my Shakuhachi with me, but did not play or even take it out. The spirit did not hit me. A good point would have been at the Golden Buddha where J-Monk, burned incense and put some smoke over his Shakuhachi, a blessing, cleansing sort of thing. I did not have incense so I miss that unexpected moment. But I did photo catch in in the process. He also blew a few notes at a couple of different spots. Being used to playing in public and on his home turf made him fully at ease. Me and his student on the other hand, were quite self-conscience about drawing attention. I did mention to her she should play something. Beside being shy she said, “I only know two notes”. I said it is not how many noted you know, it is how you play them that matters. My Sensei still after over 35 yrs of playing says he many time just plays one note. Seeking the purity of sound. Sort of like doing a shot in Kyudo, the masters are not seeking just to hit, but the purity of the shot. She said she felt better hearing about my Sensei, on her own practice of just the couple of notes. While at another place she reminded J-Monk and I of our practice when we three were debating who was going to pay for lunch, we all wanted to cover the tab. She says, Are jot you guys as Priests suppose to gratefully accept the heart felt gifts from someone making an offering… We could only smile. 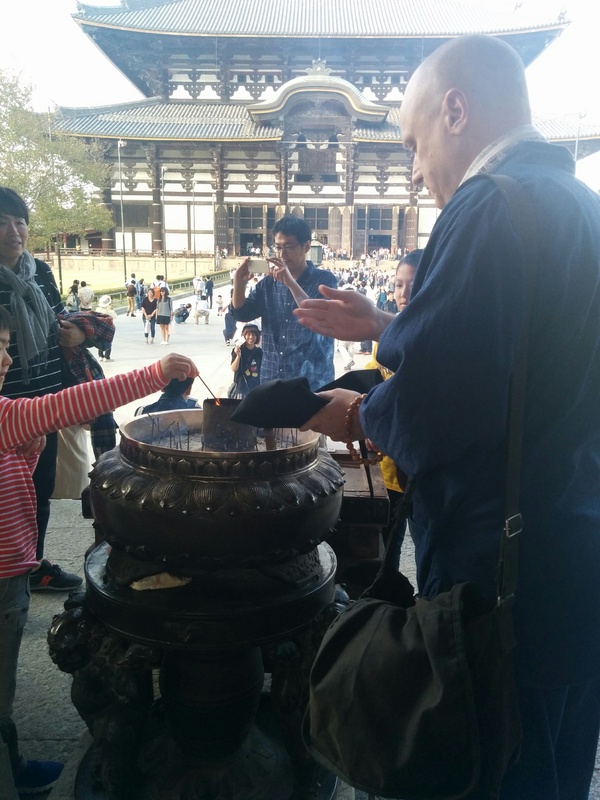 I will be returning, for part two of the Monk’n around Nara Komuso experience. I have been here a little over 3 yrs now. I started teaching Kung Fu and Chan meditation at a local community center at the mall, near home. It was not a big success but there was some mild interest. I knew it was going to be a challenge when going into this. Some three yrs later I am still at it, still struggling, like with my Kyudo practice. Hmmm maybe that is going better. I have finally found a decent affordable location to hold class. Only problem is no students. I have a “ad” running in the “meetup group” website and was quite surprised at the number of people that joined. Mostly “gaijin” ok, I thought I have found a nech . I tried to make that work, asked questions about what they were seeking, any goals. Hmmm about 3 out of 12 responded to just basic questions, what are you looking for? Ok I focused on those, I travelled to a spot closer to them rather than have them come to me. That happened once. The next time people had stuff come up, or something, although stating how interested they were. So yeah, that fizzled out. There are still,people “joining” the on-line group, however, it seems they are just Lookey Lews…window shoppers. Sigh. Oh well. 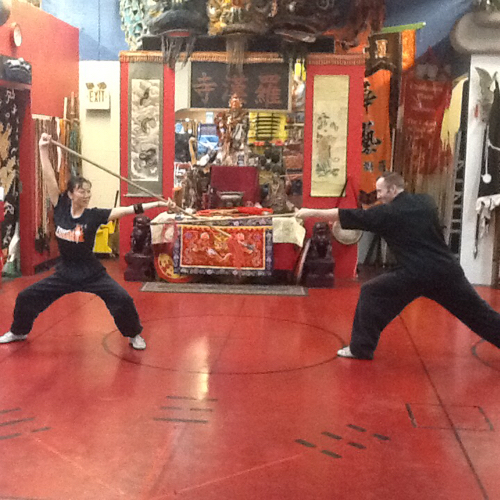 The is a former Chan student who wants me to teach her son kung fu, I am invited to dinner sometime to discuss that . This maybe another serious encounter, since it is the son’s idea, still he is young and it maybe a combo, Kung Fu and English class, which is ok. She speaks English. A friend of hers is/was interested also, but now says she is working way too much, so will have to put it off. Yeah, it is an up hill battle here. Distance, + laziness + lack of motivation + language = very low student turn out. Still I will continue to reach out. 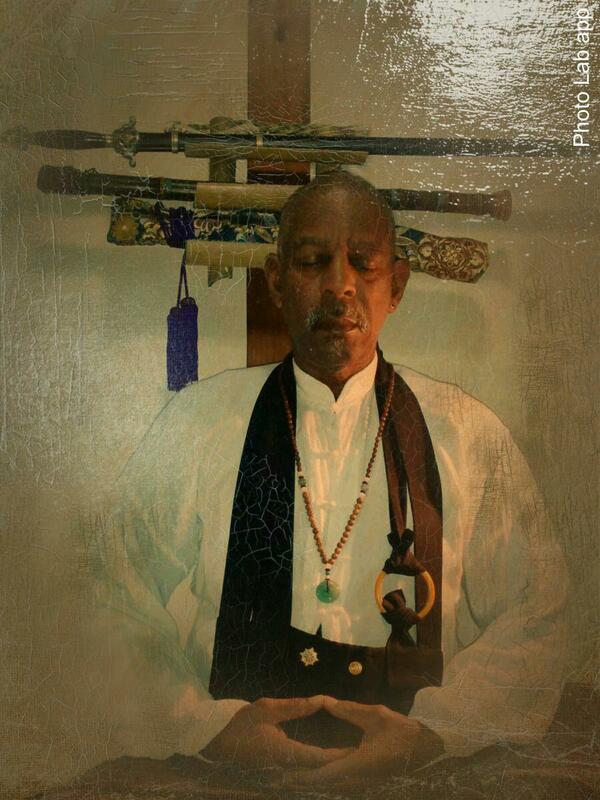 Even of there is just one student it is worth to hold the mission for my part in spreading the Shaolin Dharma. Even the one student gives me enough motivation to practice and hang in there. I forget the modern day illness of wanting convenience, and instant progress. Life is not always like that. Over coming that is part of the training path. It had been a while since I had been working for the silver center doing landscape work. They had not called, which was really ok with me, but now things had slowed down with the boating and money was get tighter. LZ called to find out what was up with no calls from them. They said they thought I was busy so did not bother. Hmmm, well whatever. She told them I had time, they said they still needed help and to pick the days I wanted to work. So I am back to the labor job, on Monday and Weds. I figured that was good. Two days a week and a break in between the days. It is good, at least I can depend on them for work for this time of year still at least until year-end. I no longer have any trust in the Yacht company. More on that later. 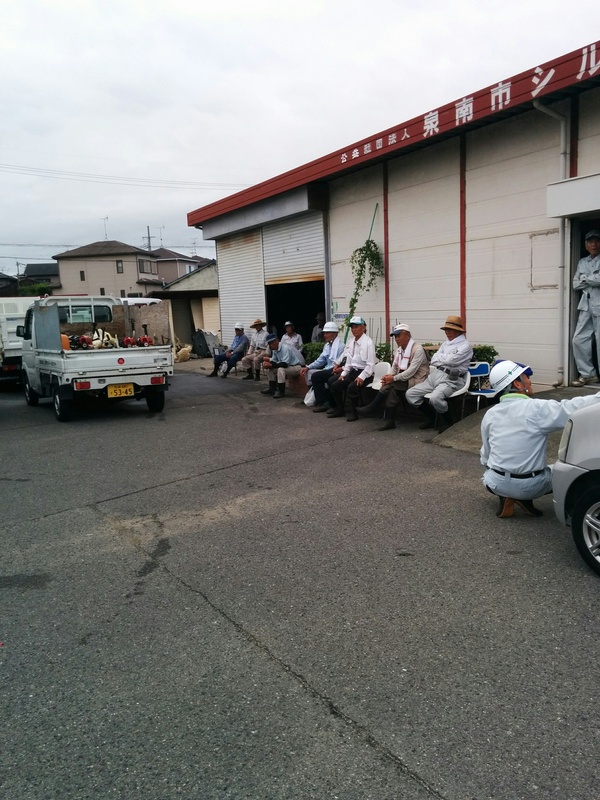 Monday and Weds I work for them, the Silver center, Tues I do Kyudo, Friday I work at the boat yard. Thursday I can choice to do nothing or something. Plus I have flexibility to switch as needed. Cool. This is a good time of the year to do this outside work. Much cooler. This summer was brutal so I am glad I missed out. Everyone was pleasant when I came in to work. A few of the old guys I like came over to talk a bit. They said I lost weight, etc, etc. One change I noticed is before I would be the only one doing warmup stretching when I got there. Now they have group warm ups in the morning before going out. One guy I noticed was not really putting any effort into the warm ups. I teased him about it afterward. He laughed and said some things I did not understand , but I got the drift. As before I am the guy on the rake detail. It is fine I am used to it now. Although I have developed calluses on my hand even through the gloves. I am bummed about that. What is really funny is as I am the youngest, I am the muscle guy for lifting. Little me, I am put on the parts that need some strength to do, loading the truck, pulling a load of grass and such up a hill to the truck. It is kind of funny. I look at it as training, some physical work is good, more so at my age, it is a good thing. So any way, it is simple work no hidden agendas, I am sure there is some ego thing involved, because people are people and there is the “sempai” thing with the Japanese, meaning the new guy vs the seniors. I am somewhat beyond that being a Gaijin, it is not so much in my face. I get a pass, sort of. But I see it with others. Anyway, it is a good Zen practice, being in the moment, dealing with only the task at hand. Still my mind wanders and I am constantly bringing it back to rack the leaves, pulls the rope, lift the branches, load the truck, not interesting , not fun, just is work, paid work, and Motion Zen training. Sort of like walking meditation…being fully present in what you are doing. 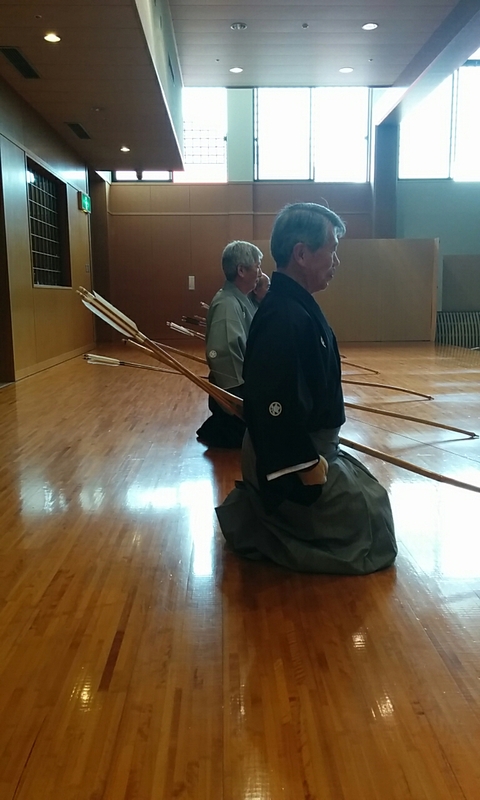 It has been a while since I wrote about my kyudo trials and tribulations. It has been a slow and many times frustrating passage. I am still a long way from where I want to be, however, even I see progress. I am throughly enjoying the Tues kimono sessions. I do not get to shoot a lot, but I do get to learn a lot about Tai Hai, and other “sets” especially doing Rensha. Others also get to learn having to work with me doing Rensha, they also have to make certain adjustments and watch their timing when I am Omai. So it is a win/win training. I am still not hitting but, I am making headway with my form, and the misc connections. I keep adding stuff I am given, and slowly slowly slowly it is coming together. I am no longer getting corrections on my draw and right hand tenouchi. Yamashita Sensei told me last night my left tenouchi is improving and gave me some more tips. I have notice my bow rotation is better when maintain a certain amount of pressure and push. Which in turn changes where my Ya hits. It is a slow learning process. I went into the dojo yesterday night, a Sat. Thinking it would be slow. I was very surprised to find out the opposite. One sempai is testing for Rensei soon, so several Renshi where there going through the tai hai with him. I had planned on a quiet evening of solo practice. I was pretty much forced into drilling with the group. It was of course worth it, but not what I had planned, but I rolled with it. I suppose that would be embracing emptiness, in Chan Buddhist thought, embracing the change, adapting, being water. It has been a while since updating, I have several to do, maybe I will have a blog marathon today…Maybe. Either way I will start with Shakuhachi. I am finally making some progress with my studies. I played a small bit of Summertime, I have been working on, for my Sensei’s opinion. He was pleased. He said he can not play like that with my use of “blues” notes. Japanese do not “hear” that way. He gave me an example of him copying me. It was different. He says he does not do well with Jazz either. He is a very good traditional player but new stuff and improvising, not so much. It really is more of a reflexion of his limitations than my skills but, I will take it anyway. 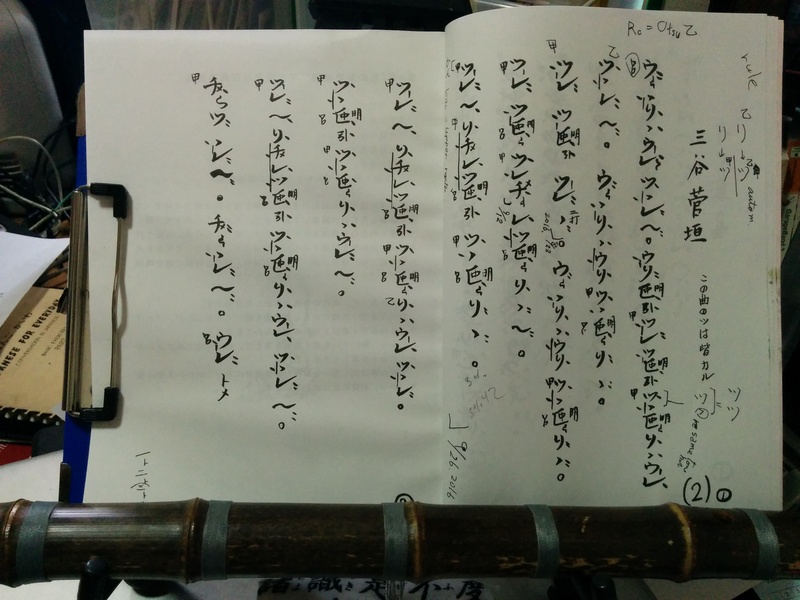 On the traditional front, I am finally almost finished my first full honkyoku zen Komuso song. What is even cooler is I am reading it, and not playing from memory. When I was a music major I was lazy, I would always end up memorizing the song I needed to play rather than just read it. I was almost going down that path again with this. However I ran into problems after a small break from class and had to repeat sections from here or here when Sensei pointed. Oh boy, I thought, this is embarrassing. Ok, I need to crack down and memorize these written Katakana notes. It was a vast improvement to my piece of mind once I did that. It will open larger venues for me, later. For now I am just pleased I can read the score I am on. When I look at it I think, oh snap, can read this scratching, how cool is that! Another thing to do with the shakuhachi but not musically. 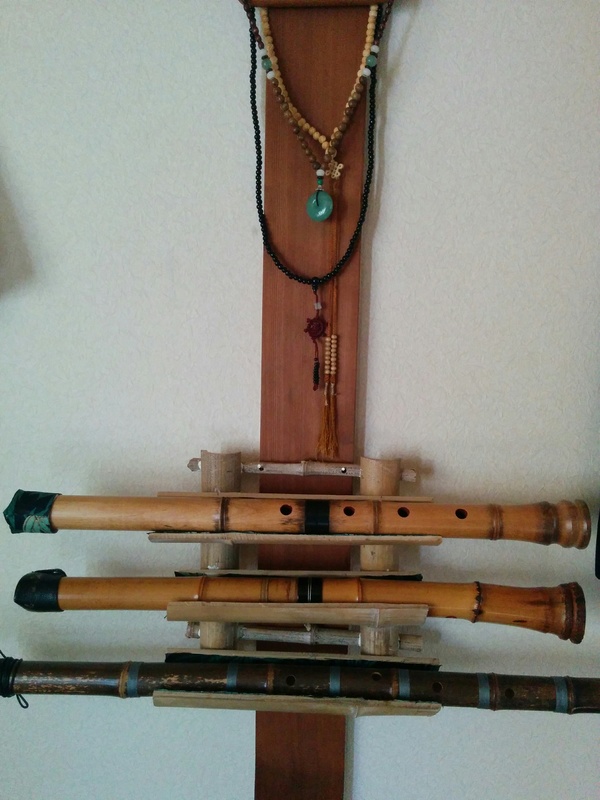 I have been wanted a place to put my shakuhachi when they needed to be stored or set down. 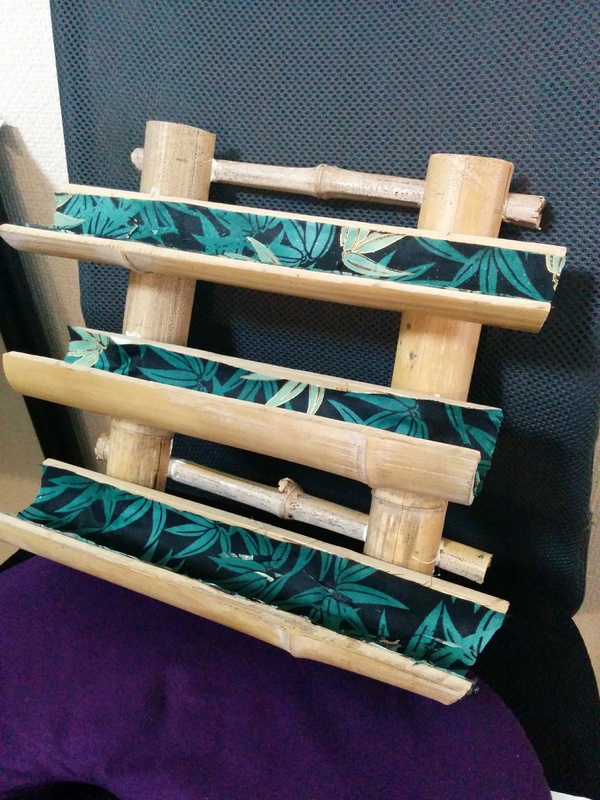 Finally after much thought and some effort I design and built a couple of stands from Bamboo. The Bamboo I gathered from a small grove next to a Buddhist temple. With very minimal tools I made two racks. One for me, which hangs on the wall. Another for my Sensei, I notice when he has several out he just lays them on the top of his piano. With the rack it will be neater and safer from rolling. I have been giving some thought to my Shakuhachi pilgrimage for next year on my two year anniversary of playing. I am thinking I may go to Kyoto , to a different temple instead of back to Wakayama. Maybe that will be my thing, every year a different Komuso temple. Next week I am off to Nara. There I will meet with a real life Komuso Monk. He will show me around and I will get some low down on the Life and times of a modern-day Komuso monk. I am interested to know more of how the Zen aspect works within this sect. Where is Hazel Rose Today?